The Wild Bergamot (Monarda fistulosa) is blooming in the meadows and is a great attractant for butterflies. I am seeing Monarchs and still plenty of Great-spangled Frittilaries. Mountain mint (Pycnanthemum tenuifolium) is also in bloom. This plant fills the air with its soothing aroma even when gently bruised. Yarrow (Achillea millefolium) is still blooming in the meadows. The goldenrods are just about to start opening their blossoms. I hiked trails recently early in the morning to beat the heat. The Wood Thrush are still singing enthusiastically. I heard Peewees (a great mid-summer sound in my mind). Towhees are also calling. We camp counselors realized with a start last week that many of the kids attending weren't born yet when we started having Crow's Nest Camp! 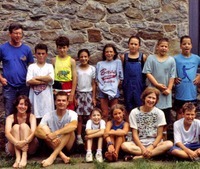 Here we are in 1998: Pete, Molly, Dan, and Eloise and our small group of campers at one week of nature camp. 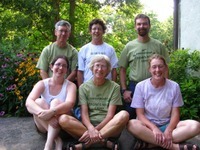 Pete, Sean, Dan, Molly, Eloise, and Patience (those of us in the green T-shirts attended all ten years of camp—good thing we haven't changed much!) This year we have had 70 kids at four weeks of camp. We've had several glorious weeks of summer camp, despite some washed-out days that made creek play impossible. Here kids explore a trail deep in the woods. The kids also spent many hours enjoying the sensory mini-golf set up in the barn, tied into the "Senses" theme of summer camp. We've just debuted the third edition of our trail map and brochure. It's not exactly a bestseller, since it's free, available at the information kiosk in our parking area or at other Natural Lands Trust preserve offices, and at Hopewell Furnace National Historic Site. It can also be downloaded here. The first version was printed in 1999 (on the left, above) and the most recent version July, 2008. All were ably designed by Natural Lands Trust's own Holly Harper. The most recent update adds trail mileages, the "Leave No Trace" message we want to convey about our preserves, adds the Hopewell Big Woods logo (of which we are a part), and updates the Natural Lands Trust logo. There is a nice article by Evan Brandt in the Pottstown Mercury today about the summer camp programs at Crow's Nest. A small part of Crow's Nest Preserve is undergoing some changes as part of a demonstration project intended to create conditions similar to those of an old growth forest and encourage the regeneration of oak trees. The project is called "Structural Complexity Enhancement" (SCE) since it takes an even-aged stand of second growth trees—those that grew up after all the local woods were logged more than 100 years ago—and creates conditions with some large and some small individuals of forest canopy trees. The area, approximately five acres, is undergoing a variety of treatments including prescribed fire and selective logging. Unlike a traditional timber harvest, Structural Complexity Enhancement removes smaller canopy trees to add growth to the larger trees. Other trees may be killed by girdling and left standing to provide cavities for cavity-nesting species (squirrels, woodpeckers, some raptors). Some trees may also be felled and left in place to add to coarse woody debris on the ground, another characteristic of old growth forest. These fallen trees encourage fungi, salamanders, small mammals as they become hollow and develop cavities. The creation of gaps in the forest canopy can then create a lighted forest floor, which encourages regeneration of canopy trees and a proliferation of understory shrubs. The recruitment of new trees makes the forest more multi-aged, a characteristic of old growth. Therefore, SCE can be used to accelerate old growth characteristics in a forest and foster the additional types of wildlife that benefit from the structural complexity. The study site also underwent a prescribed burn in the spring of 2008 to encourage oak regeneration (pictured above, a slowly creeping fire with 6" flames comsuming the undergrowth—photo courtesy Jim Thompson). Without fire, the oak forest gradually gives way to beech, red maple, and other shade- but not fire- tolerant species. Deer exclosures will be installed this year to reduce deer browse in some areas. We are also collecting data on species present at the site before and after the treatment. This site is too small to collect data in repeated plots but large enough to serve as a demonstration. A side benefit of the project is the generation of a variety of small and large logs that will be used in various building stewardship projects at Crow's Nest in the future (flooring, beams, and trim for building restorations) and educational programs (a miniature log cabin that kids at camp can assemble). This part of the preserve was chosen because it is not part of the preserve frequently used by the public and because it has the right mix of species to make regeneration possible. (Thank you for your cooperation in not disturbing the research site.) We're excited, and not a little nervous, about the changes that will take place in this section of the forest. For questions or comments regarding this project please contact Dr. Jim Thorne at Natural Lands Trust: 610-353-5587. Here's another case of not noticing something that has been all around us. We take kids to French Creek at camp for stream study and play. And on hot days I chill out in the creek after work: better than air conditioning. I knew there are freshwater mussels in French Creek—but I had never seen this species of clam before the camp kids found them this year. They're buried in the sand of the slow-moving parts of the creek, not in the riffles and rocks we turn over to look for macroinvertebrates and crayfish. The Asian clam (Corbicula sp.) is also very common. This non-indigenous species is probably the most common clam in many local waterways, according to Natural Lands Trust's New Jersey Regional Director of Stewardship Steve Eisenhauer. Steve reports that they can be found at a density of 20 - 40 per square foot in Union Lake in Millville, New Jersey, where he leads local children's environmental programs. They appear very inanimate when plucked from the stream. But in a pan of water a foot emerges from the shell and helps them move. And their siphons also emerge; they are filter feeders of algae. Steve says that the effect of this introduced species on native populations is "complicated"—which sums it up perfectly. It is likely that, as with any species introduction, there are winners and losers. A species so successful at colonizing a new habitat is likely to impact the available resources for other species. North America has a great richness of freshwater mussel species that has undergone a decline due to many causes: water quality, changes in adjacent land use from forest to farm to yards and pavement, and introduced species. As with the better-known invasive zebra mussel, the Asian clam can alter the clarity of the water, allowing sunlight to penetrate deeper, which changes the community of plants, which changes the community of other creatures that live in them and feed on them. Recently Natural Lands Trust purchased a fleet of kayaks for the Pennsylvania preserves. This small fleet will compliment the work that Steve Eisenhauer has been doing for several yearsfor NLT in southern New Jersey. We worked for several years seeking funding and contemplating the logistics of equipment and programs. Thanks to funding from Northampton County, Williams Township, Paunacussing Preserve, Crows Nest Preserve and NLT's Membership Department, we were able to purchase a fleet of top quality boats, paddles, life preservers, and a trailer for transport and storage. We would also like to recognize Old Town Canoe for providing a great package of gear. Special thanks to our local dealer, Nature's Way Canoe and Kayak, for being our contact with Old Town, and then discounting the purchase even more. Bill and Debbie were very helpful in guiding our boat and gear selection. Here is a photo of me (left) and Bill from Nature's Way during the pick up. Our first trip in the new boats was on a section of the Delaware River between Kingwood and Bull's Island. Steve Eisenhauer set up this trip for the NJ OWL (Outdoor Women's League). Jim Thompson at Paunacussing coordinated the trip. We had great weather, great water conditions and a great group of people that enjoyed spending time on the water and learning a little more about nature. Incidentally, it was a trip that I had done with the NJ OWLs a few years back that inspired me to work on this fleet. The kayaks are a great way for NLT to fulfill one of its strategic goals of connecting people with nature. I grew up around water and have revived my love for canoing in the last year. The other night, Maureen and I took advantage of a full moon to go out at Lake Nockamixon with some friends for a sunset/full moon paddle. It was a wonderful trip. We saw a Great Egret, Green Herons and several Great Blue Herons. At dusk, one of the Great Blues let us drift by it only 10 feet away. A hawk flew over with a mouse in its talons. We had Belted Kingfishers diving in front of the boats as we explored Haycock Run. But it was the bats that made the evening wonder-filled. We had thousands of bats dipping the surface of the lake grabbing insects as we paddled. We could see them back lit by the setting sun and rising moon. They flew by only feet away as we glided on the glassy water. Fortunately, everyone in the group was mesmerized (instead of terrified) by the experience. Here, "Trouble" takes a well-deserved rest from his prescribed grazing at Crow's Nest. Although we have only three head of cattle—half the stocking density of the grazing "prescription"—they are doing an effective job of reducing the brush and grass in the research area. Summer camp has started, and already we have had so much fun! We are blessed with wonderful camp kids whose sense of wonder and personal growth during camp and year to year is great to witness. One high point is on the first day of each week when the campers learn to use our new toilet-tank top sink. After a flush the clean water that fills the tank first comes out of a spigot over a small sink on the top of the tank. We save the water that would be used for washing hands by using the water that fills the tank. The kids say it's cool and enjoy showing their parents. We spend part of each day in the woods. The kids set the play area boundary and were free to roam there. Some found crayfish in a stream, others built a shelter (and invited everyone for an open house) and a footbridge leading to it, and many climbed among the branches of a giant fallen oak—a natural playground. We also had time to explore in the creek each day, even on one day when it was raining.